A quick look around my web site will convince you that I am an experienced photographer in the world of motorsports racing. I have covered Monster Energy Monster Jam events at huge indoor arenas. I have covered multiple NHRA National Mello Yello Drag Racing Series events including The New England Nationals in Epping, NH and The Summernationals at the legendary Raceway Park in Englishtown, NJ. By and far my favorite form of racing to photograph is road racing. It matters not to me if we are talking about motorcycles or sports cars. Road racing is in a class by itself defined by certain aspects which make it such an exciting genre to witness and capture. 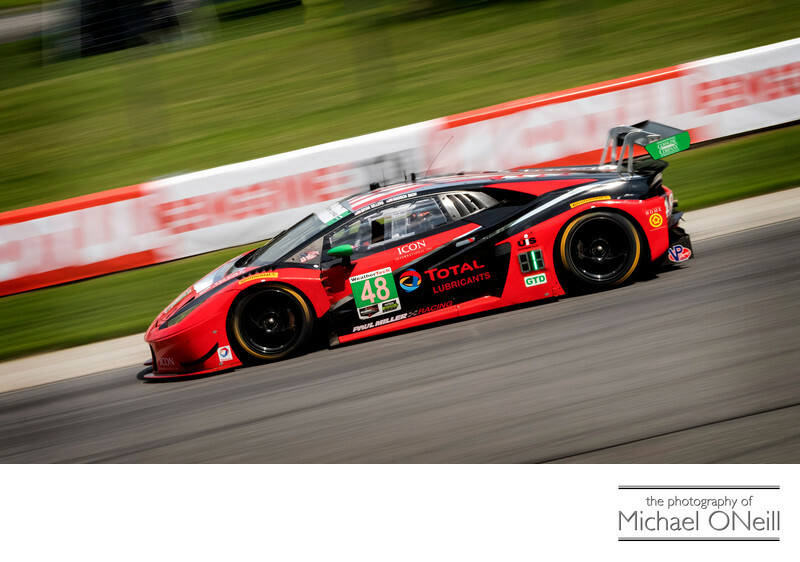 The photograph you are looking at here is of the Paul Miller Racing, Total Lubricants sponsored Lamborghini Huracan GT3 charging down the backstretch of Lime Rock Park heading into the turn known as West Bend. Therein lies the attraction, at least to me, of road racing. Every single track in the world of road racing is unique. Lime Rock, for example, is one of the shortest circuits in the world of road racing at only one and a half miles in length. The legendary Thunderbolt course at New Jersey Motorsports Park comes in at approx. two and a quarter miles and Canadian Tire Motorsport Park is slightly longer at just under two and one half miles. After that the tracks grow much larger and far more complex to navigate. Watkins Glen International (home to both IMSA sports car racing and NASCAR stock car races), Daytona International (home of the Rolex 24 at Daytona), Sebring (home of a 12 hour endurance race), Circuit of the Americas (home to many international automobile and motorcycle road racing events) and Virginia International all measure within the three mile range. Road America in Elkhart, Wisconsin is the grand daddy of them all at 4 miles with 14 turns. What this means to me as a photographer is variety. Unlike circle track racing, where the photographer’s access to the track is strictly limited to just a few spots road racing venues allow credentialed photographers the freedom to pretty much move around at will. At most events I find myself pretty much alone when I take up position to shoot ensuring that the photographs I capture will be different from all of the others being taken by my colleagues. Plus it’s just plain great exercise being on assignment as a photographer at a motorcyle or sports car road racing event. Walking the inside and outside of a three mile road course burns a great deal more calories than standing in one spot by the starting line of an NHRA Mello Yello Drag Racing Series event.